Ask your mayor to support a 100% clean, renewable energy future and add their name to the Mayors For 100% Clean Energy endorsement letter! As the Trump Administration slashes vital air, water and human rights protections, mayors and local leaders are leading our nation towards a healthier, stronger future by committing to 100% clean, renewable energy for all. That’s why we’re calling on all mayors -- regardless of political party, from big cities and small towns – to support a vision of 100% clean and renewable energy in their cities, towns, and communities, and across the country. Ask your mayor to pledge their support for 100% clean and renewable energy for all! Transitioning to 100% clean and renewable energy -- like energy efficiency, wind, solar and electrified transportation -- will protect our kids and families from pollution, create new jobs and local economic opportunities, and ensure that all people have the access to affordable energy solutions. Now is the time for action. It is up to mayors to respond to this moment by doubling down on local efforts and signaling their support for clean energy and healthy communities nationwide. I'd like to meet with my mayor on this issue. Now more than ever before, mayors and local leaders must be at the forefront of moving America towards a more just and equitable country for all people. As the Trump Administration slashes vital air, water and human rights protections, mayors and local leaders are leading our nation towards a healthier, stronger future by committing to 100% clean, renewable energy for all. That’s why mayors -- regardless of political party, from big cities and small towns – are supporting a vision of 100% clean and renewable energy in their cities, towns, and communities, and across the country. Transitioning to 100% clean and renewable energy -- like energy efficiency, wind, solar and electrified transportation -- will protect our kids and families from pollution, create new jobs and local economic opportunities, and ensure that all people have the access to affordable energy solutions. Will you join your fellow mayors and support a vision of 100% clean and renewable energy here in our community? 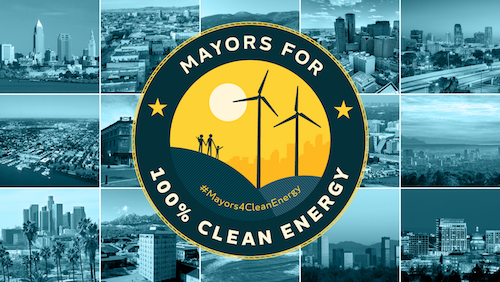 Add your name to the Mayors For 100% Clean Energy Endorsement Letter here! http://sc.org/2p74MOu Need more info? Contact us at mayors4cleanenergy@sierraclub.org.